It’s finally happening. Our 3rd installment of For the People Artists Collective’s radical coloring books is finally fresh off the press and ready for distribution! Come through and pick up your copies! Our 1st coloring book, “Color Me Rising” was made in collaboration w/ the Chicago Childcare Collective (ChiChiCo). Their original coloring book, “Color Me Rad,” truly inspired our series. We highlighted 20 inspiring actions & efforts that spanned from November of 2014 thru December of 2015 in Chicago. Our 2nd coloring book, “Color Me Resisting,” was supported by ChiChiCo again, and highlighted an additional 20 different actions + efforts for justice in our city in 2016. As we all know, 2017 was a really hard year. FTP Artists Collective decided our next coloring book would focus on healing justice and all of the work being done in Chicago. 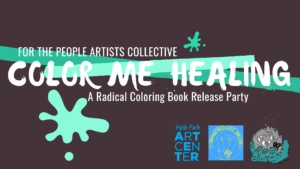 From uplifting Intersex Awareness Day to South Side’s Trans Beach Party to #NoCopAcademy, our 3rd book, “Color Me Healing,” is our biggest one yet, hence, why it’s taken so long! Folks worked really hard on this one, and we are super excited to share it with you. — All ages are welcome — especially kids! — Space is wheelchair accessible. — Activities planned: Life-size coloring pages to color in, fun games, and more TBA! — A very, very short program will happen at 2:30pm. If you are with an organization that works with youth, or are featured in the 2018 coloring book, please email forthepeopleartists@gmail.com so we can set aside a number of copies for you. If you supported the coloring book going to print and pre-ordered on Indiegogo, this is the time & place to pick them up! Thank you for your patience and for supporting our work! This event is possible thanks to the support of the Chicago Childcare Collective, the Hyde Park Art Center, and Crossroads Fund!